Image caption Scrapping Nimrods will lead to a BAE site closing earlier than previously thought. Defence firm BAE Systems has said it is planning to shed almost 1,400 jobs - mainly as a result of cutbacks made in the government's Spending Review. The jobs are set to go in Lancashire, Greater Manchester, Moray, Ayrshire, Hampshire, Rutland and Somerset. The Spending Review included plans to cut defence spending by 8% over four years. 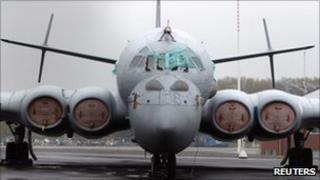 Nimrod surveillance planes and Harrier fighter jets - both of which BAE worked on - are being axed. The cancellation of the Nimrod MRA4 programme would also see the Woodford site in Cheshire close earlier than announced, BAE said. It said in September last year that Woodford, which employs 630 people, would close at the end of 2012. However, no new date was given. BAE said it had been studying the impact of the review on its business, adding that it had now begun consulting on "potential job losses" at six sites plus two RAF bases. It said the job cuts were "designed to ensure we remain competitive as we actively pursue a number of opportunities for other products and services, both in the UK and internationally". At Chadderton in Greater Manchester (79 potential job losses), Prestwick in Ayrshire (55), Yeovil in Somerset (15) and RAF Kinloss in Moray (30), the potential job losses were linked to the cancellation of the Nimrod, BAE said. Losses at Farnborough in Hampshire (214) and RAF Cottesmore in Rutland (127) are associated with the early withdrawal of the Harrier fleet. Meanwhile, Samlesbury (119) and Warton (668), both in Lancashire, have been hit by both projects. BAE Systems said a further 90 UK jobs might go at its Saudi Arabia business, mainly at Samlesbury. The Unite union said the announcement was "a tragedy for the workforce and for Britain" and called on the government to rethink its defence plans. "The coalition government's Christmas present to over 1,000 skilled workers who support Britain's armed forces is the sack," added national officer Bernie Hamilton. Meanwhile Keith Hazelwood, national officer of the GMB, said it was a "devastating blow for UK manufacturing and the local communities". He said his union would look to see if any of the workers could be redeployed to other projects, including green and space technology.